You’re on Birthday Wishes for Son – Page 7 of 10 Birthday Wishes and Quotes. See complete menu at bottom of page. Included on this page are many examples of birthday wishes for sons. Sons are among the sweetest gifts one can enjoy in a life. A son is a dream come true for every parent. He’s a bundle of your future hopes and dreams. He’s a second chance at life and life’s experiences for you. When it’s his birthday, you want to make sure that you tell him how much the occasion matters to you. No matter how young or old he is, he will always be your baby boy. Make sure to shower all your love on him with these beautiful birthday wishes. How to Write Birthday Message to Your Son? Think about what makes your son special. Your card and words should be a reflection of that. Take some time and organize your thoughts. What makes your son a great person? A caring nature? A hard worker? Brings out the best in others? Personalize your message to your son. Begin with the end in mind – how do you want your son to feel after reading your message. If possible, add an image to the message. If you sending an email or a message/share through social site, this can be easy. Even if you are sending a greeting card, you may include a childhood photo of your son or a younger photo of him eating cake or celebrating an earlier birthday. Pick a good writing instrument. Make a statement with a bold marker. And, always, remember to keep your writing neat and legible. Make sure that you write the birthday message keeping in mind your son’s age. If you have a young son, adding something funny can help make him laugh. But always keep it short and simple. You know how boys are! Remember, kids always want to get to the gifts first. It’s the gift that’s on top of his mind. So make sure to get him something that he can easily relate to. It will make it easier for him to pay attention to the birthday message too. So choosing the right gift for your young son is also an important part of getting your message delivered to him. Another good strategy can be to incorporate his favorite cartoon character. Dear son, no matter how much you grow, you will always be our baby boy. We wish you a very happy birthday and may all your wishes and dreams come true! We want you to know that we are so lucky to have such an amazing son. Here’s wishing a happy birthday to the best son in the world! When you blow the candle in the cake, we want you to remember that there is a candle of love in our hearts for you that will burn forever! Wishing you a very happy birthday! You are a miracle that happened to us, a miracle that’s one in a billion. Wishing you a very happy birthday! You have always brought a smile to our face every day of our life since you were born. We wish that every birthday brings you more and more smiles! Happy birthday! Dear son, wherever you are in life, always remember that I will be proud of you forever. You son are the best thing to ever happen to me. I will always be proud of you. Wishing you a happy birthday! Dear son, I wish this birthday will be followed by many such happy and beautiful occasions. My love and best wishes will always be with you! Wish you a very happy birthday! Check out Funny Happy Birthday Greetings! Happy birthday to the biggest gift and the biggest joy in our life! There’s no limit to how much we love you! May you enjoy a wonderful time and happy moments on your special day! I wish you a very happy birthday! We will always cherish the special moments we shared. Wishing you a very happy birthday and happy moments in your life! On your birthday, we wish you success, happiness and health forever! Happy birthday son! Best wishes to our amazing son! May all your choices in life lead you to success and happiness! Happy birthday dear! It’s time for birthday celebrations! Wishing you lots of fun on your special day! There’s nothing more exciting and satisfying to have seen you grow and turning into such an amazing person. Wishing you a very happy birthday! Wishing a very happy birthday to our awesome son. We wish that all your dreams and hopes will come true! Our love for you will always be endless. Our birthday wishes for you are from the bottom of our heart. I am so blessed to have you as my son. Wish you a very happy birthday on this special day. My you succeed in all your pursuits and find happiness forever! Every time I think of you, life reminds me how beautiful it is. You are the proof that god loves me and blessed me. A very happy birthday on your special day. I wanted you to know that I cared and loved you! I will always want the best for you. They say it’s hard to be a parent. I am happy to have the best son in the world. You made it fun and exciting for me to be a parent! Happy birthday to my boy! There’s no binding to my happiness as I see you grow every day. Every day I look at you, I see more of myself in you! Dear son, you have always been a prince of the family. We wish you a very happy birthday and glorious life ahead! Wishing you a happy birthday and that you may have a successful and happy year ahead. Wishing that your birthday brings more sweet memories into your life. Dear son, we have always been made proud by you. You will always have our support and blessings. Happy birthday to the dearest and most beautiful son! We are so glad that you have grown into such a wonderful person. Wishing you a very happy birthday and that you always have a wonderful life! There is nothing that compares to the feeling we have when we see our little boy grow up into such an amazing gentleman. We are proud to be your parents. Here’s wishing you a very happy birthday. This birthday, may you receive more love, happiness and successes than ever. Wish you a very happy birthday dear son! Dear son, you brought unmatched happiness into our life. We have always loved you and will always love you in the future! Wish you a very happy birthday! Dear son, we are so proud to see you group up. We are always full of joy and proud of you whenever we think and talk of you. I wish you a very happy birthday. My dear son, may this birthday bring you more love, joy, happiness and prosperity in yet another amazing year in your life. You always deserve the best in life because you are a great son and an amazing human being! Wishing you a very happy birthday! Dear son, you have been much more than a son to me. You have been the most beautiful gift from God. I have cherished all the precious moments watching you grow up and the tender memories will remain close to my heart forever! I love you son. Happy birthday! On this special day, I wish you that you are blessed with all the happiness and good health in your life. I wish you a very happy birthday son! I want you to know that you have never given us any trouble as you grew up. You have always been the best son in this entire world! Wishing you a great birthday and prosperity in future! My son, you don’t know but watching you grow has been one of the biggest delights of my life. No matter what challenges you will face in life, I wish you will climb all mountains in your life. I wish you a great birthday and a great life in the future. If you have any additions for our collection of “Birthday Wishes for Son,” please let us know. As you turn another year older, I want you to know that you will always be the same little boy in my heart. I will always be proud of you. Wishing you success forever in your life on your special day. Happy birthday! There’s no joy greater for a mom than in seeing her little boy growing! I treasure each memory I cherish with you. Wishing a happy birthday to the most precious gift in my life! Dear son, it was the greatest day of my life when you were born. It was the day when my heart was filled with all the love in this world. And since that day my heart has kept growing with more love! Happy birthday to the most wonderful boy in this world! Dear son, I want you to know that I will always love you, cheer you and will be by your side. Wishing you a very happy birthday and that all the days of your life be filled with love, joy and happiness. Dear son,, on your birthday I wish you all the strength to face life’s challenges, all the knowledge to succeed in your life, the best of friends and a great family to share your happiness with. May your life be full of happiness. Wishing a very happy birthday to the sweetest boy in this world! 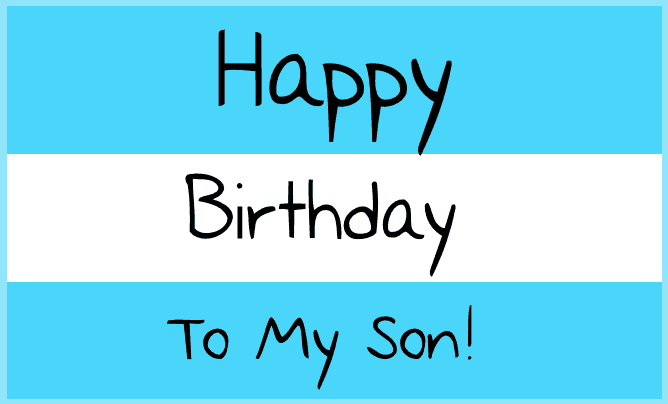 My dear son, today is the best day to celebrate you! Wishing you a very happy and amazing birthday! I have always wished to see you grow into an honest, successful and hard working lad. You are a living proof that god exists. Wishing a very happy birthday to my dear son! Dear son, happy birthday! No matter how big you grow, you will always be my sweet little boy! My dear son, I want you to know that you have always been the Sun in my life. You have been the bright daylight of my life that shined through each day of my life since you were born. Wish you a very happy birthday! You are the one reason I smile every day of my life. Wishing you an amazing birthday that brings more happiness and prosperity into your life! As you enjoy your cake this birthday, I want you to know that you are the most beautiful gift in my life! I wish you a very happy birthday and a great new year in your life! A very happy birthday son! You will always have a piece of my heart. I love you! Dear son, you have always made me proud. My support and blessings will always be with you. I wish that you will have a great and prosperous life ahead. Remember I will always be with you! Wish you a very happy birthday! In you my son God gave me another chance to fulfill my dreams! Wish you a very happy birthday! May God’s love be always with you. But god’s love and grace to bless you! If I can give my son only one gift, it will be enthusiasm forever! Life, a great life waits for you; may you never forget this! Your past is not a sign of your potential; you can always liberate your future in any hour! Celebrate this day to your fullest; mark this day to achieve greater milestones ahead! We wish you a very happy birthday! May sunshine, happiness and love fill your day not only on your birthday, but for the rest of your life! Wish you a great birthday! If you have any suggestions for our “Birthday Wishes for Son” page, please let us know.